The initial cause for concern that a child may have hydrocephalus is acceleration in the rate of growth of the head. Other entities also cause such acceleration, and they should be considered. Familial macrocephaly: The only abnormality is an enlarged head without any other underlying conditions. Usually there are other family members with large heads, and the condition is considered a family trait. This is often associated with benign extraaxial fluid collections of infancy. Benign extraaxial fluid collections of infancy: Velocity of head growth is abnormally high in the first few months of life due to the accumulation of CSF over the brain’s convexities. The rate of head growth then tends to normalize by 15–18 months. Physical examination and developmental status are usually normal, although occasionally a mild and transient delay occurs in motor development. Other descriptive terms for this same condition include benign subdural collections of infancy, benign communicating hydrocephalus, idiopathic pericerebral swelling, benign enlargement of the subarachnoid spaces, hypodense extracerebral fluid collections, pseudohydrocephalus megalocephaly, extraventricular obstructive hydrocephalus, benign hygromas, and subarachnoid effusion. This is generally a benign, self-limited condition that presents between the ages of 3 and 12 months and resolves spontaneously by 2–3 years of age. Surgical intervention rarely is required and is reserved for those patients who experience gross motor delay, a rise in ICP, or enlarging fluid collections. Ultrasound Scan from an Infant with Familial Macrocrania: Coronal image shows extraaxial fluid collections outside the frontal and temporal lobes. The ventricular size is within normal limits. 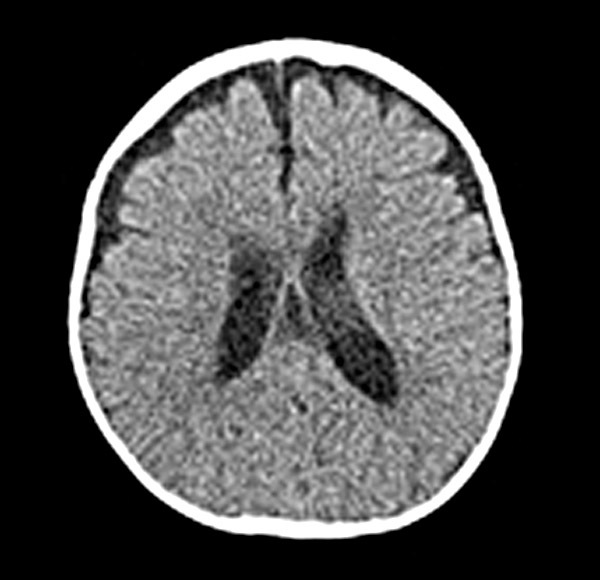 CT Scan from an Infant with Familial Macrocrania: Scan without contrast shows bifrontal hypodense extraaxial fluid collections in the setting of mildly dilated ventricles. 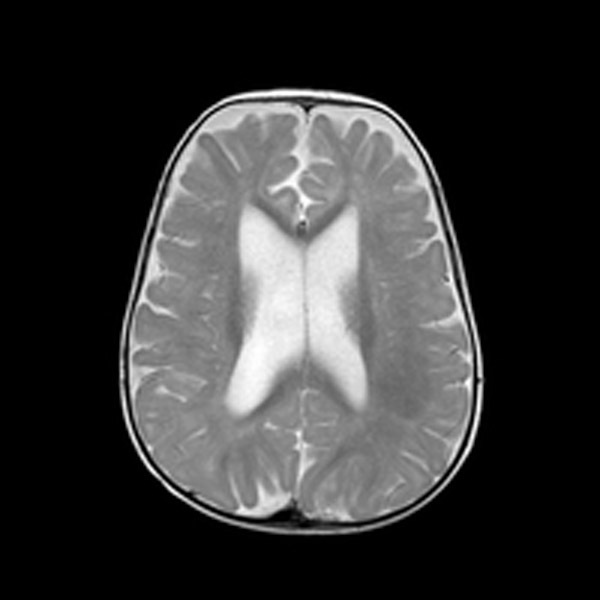 Axial T2-weighted MRI from an Infant with Familial Macrocrania: Scan shows bifrontal fluid collections isointense to CSF with mildly dilated ventricles. Chronic or acute-on-chronic subdural hematoma: When present, non-accidental injury should be considered. Tumor: Tumor growth with resultant raised ICP can present in a similar fashion to hydrocephalus but is readily differentiated on imaging. A tumor can also be the primary cause of an obstructive hydrocephalus. 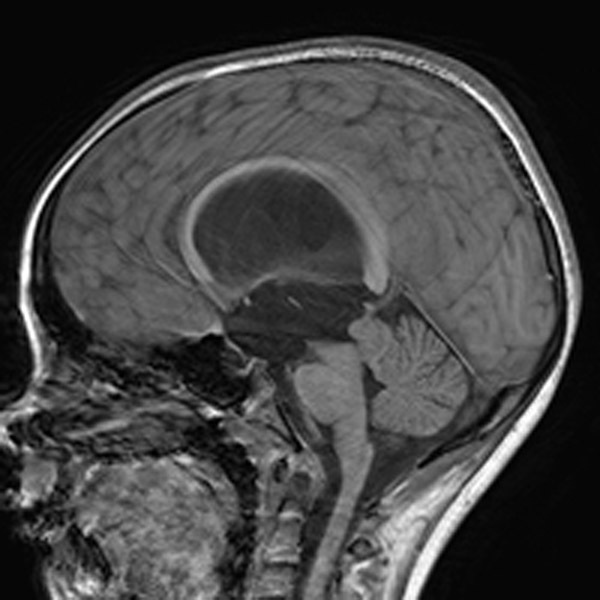 Arachnoid cyst: An enlarging arachnoid cyst with resultant raised ICP can present in a similar fashion to hydrocephalus but is readily differentiated on imaging. Certain cysts, especially those in the suprasellar or quadrageminal regions, can also be the primary cause of an obstructive hydrocephalus. Ex vacuo enlargement of CSF spaces: This condition, also sometimes called ex vacuo hydrocephalus, is associated with global enlargement of the cortical sulci. This is in contradistinction to ventricular enlargement “out of proportion” to sulcal enlargement, which is considered suggestive of hydrocephalus (8). Macrocephaly: There is increasing head circumference crossing percentile lines. Bulging anterior fontanelle: Examination of the baby while restful and held upright reveals a fontanelle that is bulging or even tense. “Sunsetting”: Upward gaze palsy, a component of Parinaud’s syndrome, which can also include retraction of the eyelids. Bradycardia and/or apneic episodes: These episodes may occur in more advanced cases. Delay in development: Infants fail to meet normal developmental milestones. Papilledema: Papilledema usually is present in more severe cases of longer duration. Abducens nerve palsy: The palsy may be unilateral or bilateral. Delay in development: Children fail to meet normal developmental milestones. Normal results expected: Blood tests are generally expected to be normal, with the occasional electrolyte imbalance that might result from excessive vomiting, e.g., hypokalemia. 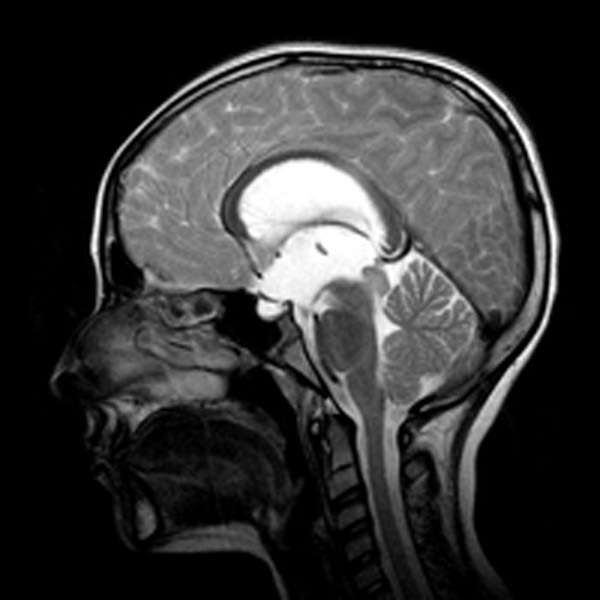 Radiographic imaging seeks to illuminate distortions of the brain and ventricular system resulting from hydrocephalus. Severe hydrocephalus may cause herniation of portions of the ventricular system or distortion of adjacent brain. Chiasmatic and infundibular recess: The most common distortion is herniation of the anterior recesses of the third ventricle, leading to inferior herniation of the chiasmatic and infundibular recesses. Sagittal T2-weighted MRI of Herniation of Infundibular Recess: Shown is triventricular hydrocephalus associated with a tectal glioma and aqueductal stenosis. The inferior recess of the third ventricle is ballooned. The infundibular recess has herniated into the sella and displaced the pituitary gland. Suprapineal recess: The suprapineal recess of the third ventricle is another common site of ventricular herniation, displacing the pineal gland inferiorly, elevating the vein of Galen, and compressing the tectum. Sagittal T1-weighted MRI of Herniation of Suprapineal Recess: Mid-sagittal T1-weighted MRI of the brain demonstrates obstructive hydrocephalus in the setting of a tectal glioma and aqueductal stenosis. All recesses of the third ventricle are distended, including the suprapineal recess. Atrial diverticula herniation: Severe hydrocephalus may cause the formation of atrial diverticula, with herniation of the ventricular wall through the choroidal fissure of the ventricular atrium into the supracerebellar and quadrigeminal cisterns. Assessment of macrocrania in infants: Ultrasonography is indicated for infants presenting with gradual macrocephaly who clinically fit the picture of benign subdural hygroma or familial macrocephaly. 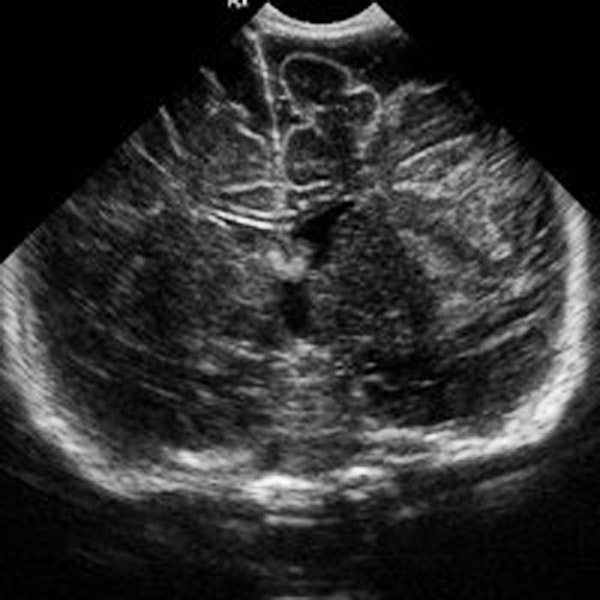 Pattern of ventricle enlargement suggests a type of hydrocephalus: A characteristic pattern of ventricular enlargement may suggest aqueductal stenosis in a fetus or infant. Emergency evaluation: A CT scan is indicated for an infant or child with obvious clinical evidence of symptomatic raised ICP. MRI may also be needed: Work-up begins with CT but will likely require MRI prior to definitive therapy. For instance, triventricular enlargement seen on CT scanning is only suggestive for aqueductal stenosis, and MRI is needed to better appreciate the anatomy of the aqueduct. T2-weighted images for CSF spaces: T2-weighted MRI will best show ventriculomegaly and periventricular edema. MRI used to determine etiology of hydrocephalus: MRI is indicated in cases where a brain tumor is suspected or if the etiology of hydrocephalus is not clear on the basis of CT. MRI is the imaging method of choice when aqueductal stenosis is suspected. Fast MRI for young children: “Fast” MRI is increasingly being considered in place of a CT scan to lessen radiation exposure. Not used: These tests are not generally useful for the evaluation of hydrocephalus. Used to evaluate incidental ventriculomegaly: In children with a chronic onset of hydrocephalus who are not in need of urgent surgical treatment, baseline neuropsychological tests might reveal subtle cognitive dysfunction. Age and imaging: Treatment options are assembled on the basis of patient’s age and the presumed type of hydrocephalus as determined with imaging.